Ulster People Wins Big in Yesterday’s Primaries! While it will still be some time before the results of the write-in campaigns are known, we are pleased to announce that all 4 candidates Ulster People endorsed in the Democratic primaries for Ulster County Legislature won last night – and all with over 69% of the vote! Congrats to the candidates & thank you to all the volunteers who wrote letters, made phone calls, and knocked on doors! 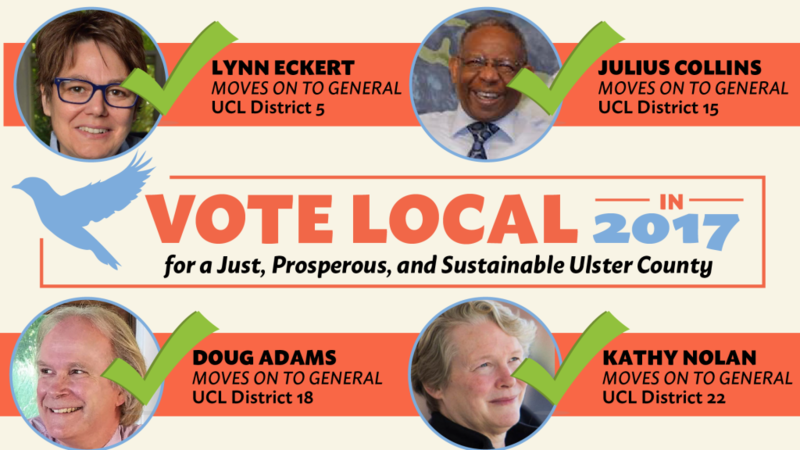 Together we can achieve a just, prosperous, and sustainable Ulster County – onwards to the general election! PS. We need your help to win in the generals! Please join us and get involved! Announcing Ulster People’s endorsed candidates for Ulster County Legislature! 2017 Ulster County Legislature Election Results & Thank You! !